1. Place a large frying pan over a medium heat. Toast the oats for 3 - 4 minutes, tossing regularly, until golden; set aside. 2. Put 100g raspberries in a small pan over a low heat. Add the icing sugar and heat gently until warmed through and there is a small pool of juice at the bottom of the pan. Allow to cool, then gently stir in the remaining raspberries, reserving some to garnish. 3. 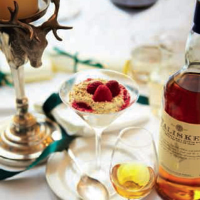 Whisk the cream to medium peaks, then stir in the honey, whisky and three-quarters of the oats. Spoon into individual dishes, top with a few raspberries, then spoon over a little more cream. Scatter over the remaining oats, top with a few more raspberries and serve.